The garlic bulbils, saved seed, is growing well. They will produce one large clove at harvest time in July. It appear all that were planted germinated. 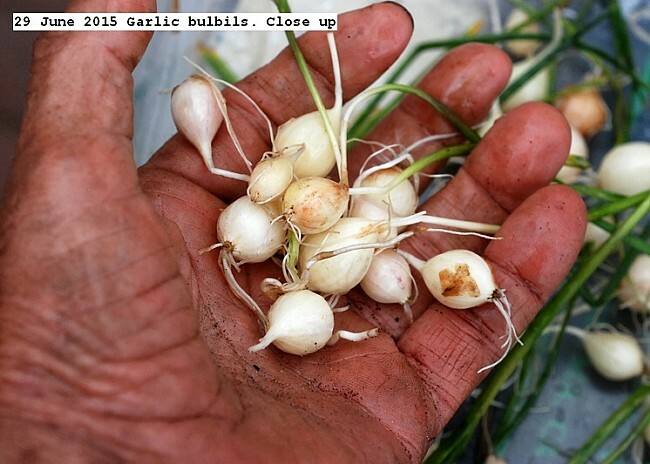 The garlic bulbils planted in October 2014 were harvested and put to dry for seed in October 2015. About 50 bulbils were obtained. Next year the bulbils will produce about three cloves per bulbil. The following year the planted cloves will produce normal sized bulbs. This entry was posted in Uncategorized and tagged Garlic bulbils. Bookmark the permalink.